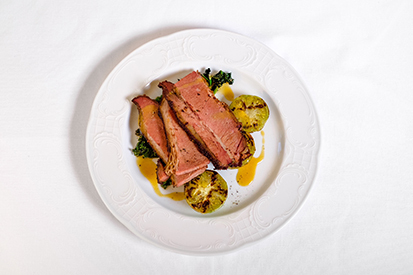 Sue Ellen specialises in classic dishes from the southern coast of the United States. Since opening its doors in November 2017, Sue Ellen has quickly found its way into guests’ hearts and established itself as the go-to venue for relaxed dinner and drinks in Helsinki. Located in the city centre, on Helsinki’s south harbour front, the restaurant is open from Tuesday to Saturday, serving meat, seafood and vegetarian dishes – all with the unique flavours of the southern United States. The restaurant’s menu is compact, with a handful of options that change with the seasons. “Our menu includes tried and tested recipes, and all our dishes are made from the very best quality ingredients,” Harjula says. In addition to the à la carte menu, there are specialities available for pre-order, such as the restaurant’s pride – a whole suckling pig. “The whole suckling pig is a perfect demonstration of what we’re about: sharing tasty food among friends,” Linnamäki explains. Sue Ellen is housed in a former colonial merchant’s home, which retains many of its original features, including a stunning ceiling. “The building itself is one of the oldest in Helsinki, and is protected by the Finnish National Board of Antiquities,” Harjula points out. “The building’s historical feel is tangible, and it adds to Sue Ellen’s charm. The restaurant’s design oozes warmth and homeliness, helping to create an authentic southern feel.” The building’s historic features are further accentuated by vibrant décor, including colourful textiles and plants. The restaurant also has a bar area that serves traditional cocktails and snacks, and has a large selection of bourbons and wines. In addition, Sue Ellen has a wine cellar, which can be hired for private parties and which seats 30 guests. The comprehensive wine list includes the best selection from America, Europe and elsewhere, which sommelier Samuil Angelov has carefully selected to complement the food.